Fish is a healthy high protein as well as being high in omega-3 fatty acids, fish contains selenium, zinc, iodine and vitamins A and D. People who regularly eat fish have a lower risk of heart disease and stroke. 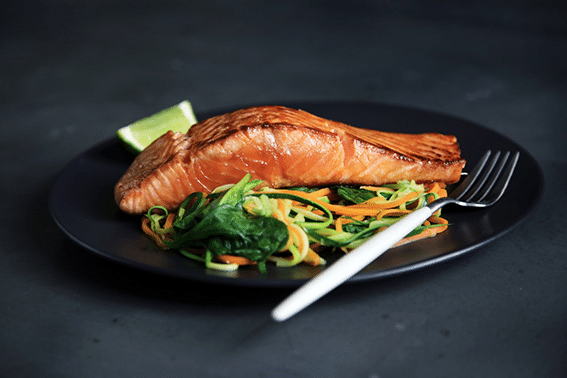 Consuming 1 to 3 serves of fish a week has also been linked decreased risk of developing asthma, improved brain and eye function, reducing the risk of dementia, improved blood glucose control in diabetes, reduced risk of delivering a premature baby during pregnancy and may help relieve the symptoms of inflammatory conditions such as rheumatoid arthritis. It’s best to avoid fish high in mercury especially for children under 6 and pregnant women. Line a large oven tray with 2 long sheets of foil. You will need enough foil to enclose the fish completely. Top with a piece of baking paper. The baking paper will help you transfer the fish onto your serving platter when the fish is cooked. Just slide the paper out from under the fish once it is safely on the platter. Place the fish, skin side down on the baking paper. Top with dill and sliced lemon. Fold the edges of the foil up and crimp them together over the fish, forming a sealed parcel that completely encases the salmon. Place in the oven and cook until salmon is cooked through, 20-30 minutes depending on how you like it cooked and the size of the fish. You can check the fish with a small knife by testing whether flakes will gently pull apart at the thickest part. Transfer to a large serving plate. When serving, cut down to just above the skin or break into large chunks using tablespoons. Serve with your favourite salad and natural yoghurt flavoured with lemon juice and dill.